The Honda Civic’s local introduction was one of the most anticipated launches of 2016, and the launch report was one of our top ten most popular stories last year. Half a year has passed, and the Civic FC is now a common sight on our roads. So far, this observer has seen a much greater proportion of the Civic 1.5L Turbo compared to the entry-level, naturally-aspirated Civic 1.8S. 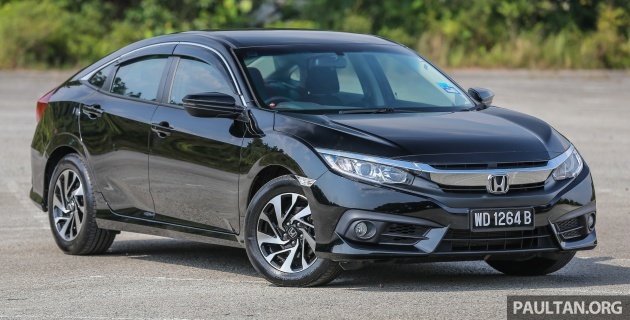 A quick check with Honda Malaysia (HM) has confirmed that – the company has sold over 10,000 units of tenth-gen Civic so far (from its June 2016 launch till January 8) and of that total, 67% were Turbos. That’s a staggering amount of buyers opting for the top powertrain, which has surprised even HM. The Civic has breathed new life in a once core segment that has seen buyers shift to SUVs and crossovers, and much of the hype was generated by the “VTEC Turbo” variant. Understandably so, as it’s the first mainstream Asian brand to go the downsized turbo route made popular by Continental makes. A forward-looking (and very evocative sounding) engine to go with the radical design might have been a killer combo for many. But two out of every three Civics sold? That’s unprecedented. What about that overlooked Civic 1.8? As seen here, it gets that same eye-catching body, but without the Turbo’s 17-inch five-spoke rims. Instead, the 1.8 rolls on 16-inch wheels with 215/55 rubber. Only the rims differentiate it with the entry turbo variant, the 1.5TC – both use the same automatic halogen projector headlamps with LED daytime running lights. The top-spec 1.5TC-P shines bright with LED headlamps, LED fog lamps and chrome door handles. The R-series SOHC NA engine is a carryover with improvements. It makes 141 PS at 6,500 rpm and 174 Nm of torque at 4,300 rpm. Retuned to match the more efficient CVT (over the old five-speed auto), fuel consumption and emissions have been improved over the previous Civic 1.8 FB. Honda claims combined FC of 6.3 litres per 100 km (15.9 km/l). 0-100 km/h is done in 10.4 seconds. To compare, the 173 PS/ 220 Nm Turbo’s official FC rating is 17.2 km/l and it does the century sprint in 8.2 seconds. Our base Civic is actually very well-stocked with kit, compared to the Thai-spec 1.8 we tried in early 2016. Some of the more prominent USPs are standard: remote engine start and walk away auto lock, a full colour digital LCD meter panel, steering audio buttons with electrostatic switch and electronic parking brake with auto brake hold – they’re all included. Other goodies include keyless entry and push start, cruise control, a seven-inch touchscreen head unit with reverse camera and an eight-way powered driver’s seat. The only things it lacks compared to the top Turbo are leather seats, dual-zone air con and navigation. The 1.8S is priced at RM110,426, which is RM13,650 cheaper than the base Turbo and a massive RM21,457 less than the Turbo Premium. 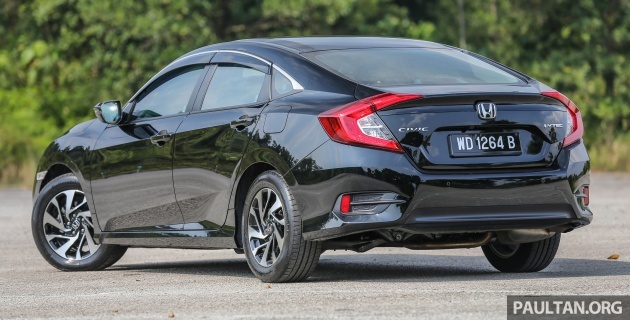 Even before knowing the Malaysian 1.8S specs (much better than expected) and price advantage (large), this writer stuck his head out to prefer the NA-powered Civic. The Turbo, while fast and powerful enough, lacked a bit of sharpness for me. “It’s better at ‘rolling starts’ than traffic light GPs and cut-and-thrust racing, a smooth operator that works best with a smooth driver. Of course, this isn’t at all an issue if you’re not expecting GTI-like sharpness from this family car,” I said of the Civic Turbo in May. “For this reason, the 1.8L is my pick. Paired with the package-improving CVT and an all-round better car, the starter engine serves up more than adequate performance for a daily driver, and its basic amenities (Thai-spec car) serve this tech-averse writer well. If I were to have more power and speed, I’d like to feel the rush as well, and not just arrive there,” this writer argued. That’s just me, of course. The lure and promise of “VTEC Turbo” has proven too strong for 67% of Civic buyers so far, and that’s completely understandable. Don’t dismiss the 1.8S without trying it out first, though – it’s quietly competent. CVT is a bane and should be discontinued. A 6 speed slick manual transmission or paddle shifters would be great in this car. Price it below 100k. so many unrealistic points made in a single statement. i loathe CVTs to high hell, but they’re here to stay for a variety of reasons…efficiency being the primary one and it’s a big consideration in global markets. these things are determined by a larger market force. the tiny bolehland market pales in comparison to influence any kind of major development aspects for global cars. This car is historic. It wiped out the Altis from the face of Malaysia. UMW salesman all had to go PArkson to sell liingerie to supplement their income and humble themselves down. Previously so arrogant and cocky. U too r toyota salesman, apa mau cakap? Honda Malaysia was surprised by the sell number of turbo variant!? Please conduct your marketing study properly. I will said a reliable turbo car is definitely welcomed by Malaysian when their prices are placed right. People who buy the 1.8s are usually used to ferry his/her family. With 141 PS & 174 Nm of torque, it is no slouch. Couple with a smooth CVT, U get a seamless transfer of power to the wheels. I would say most of the 67% who bought the Turbo’s are young or YUPPIES as we call them. This group buy the Turbo bcos, its a “TURBO”. It is faster & they can impress their girlfriend & friends alike. Chances are most of them goes 2 Papa Rich, Starbucks or Coffee-beans as their place 2 hang out. Congratulation 2 Honda who managed 2 sell 10k units in a mere 7 months is a testament to their products. Enuff said. No one cares your comment. Afterall even in Vellfire/Alphard or Harrier, and even NX200T, it is also full of plastic, some part wrap with leather or PVC, thats all. 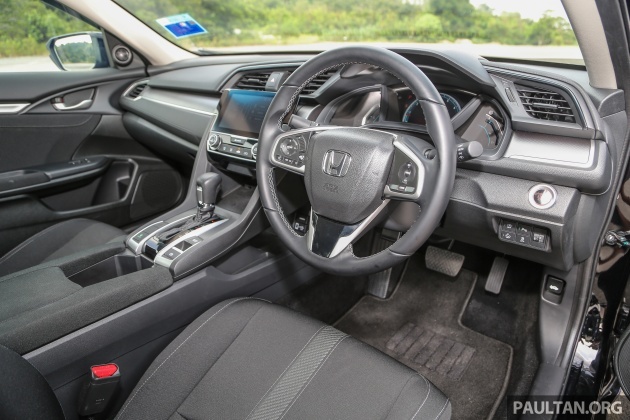 Civic have the best in class interior. Go to look at other brand before commenting, else you just plain stupid. How to stop rattling dashboard? That mean vellfire/alphard and nx200t is overprice lor, clever! Well done Honda. This is what Malaysian wants, turbo! And the statistic speaks for itself. Hope you bring in more turbocharged cars. Volkswagen already has turbocharged cars from its B segment Vento, to C segment Jetta and D segment Passat. Honda is starting of very well, good job there. Toyota sales is plunging, no one wants underpowered NA engine and old technology, sorry Toyota, your time is over. the continental downsizing + turbo combination was intended for better efficiency and of course meeting emissions standards. malaysians want “turbo” because they thinking “more power can cut people off”…you might not admit it, but the devils horns show evidently on our roads. that being said, if these folks look entirely at spec sheets they’ll be disappointed by the real world power delivery…or maybe they won’t, because they can’t tell the difference in the first place. Obviously you never drive one. Light pushing on pedal is enough to move the car far away in front of others. Go figure. My 1.8s is giving me 9.3 km/l … I don’t think the figure of 15 km/l is a practical one in dense malaysian traffic . 9.3km/l is quite bad. i think your FC will improve over time. of course, fc will still be bad in traffic jams. my blm was giving me 10km/l because 80% of my time commuting to/from work was made up of traffic jams. every 5 days kena isi full tank. Which route you drive everyday? I had the same issue, but now that I am closing into my first 10,000 km, I am seeing an average 12.5km/l when driving from Shah Alam to KL, and 13km/l on long distance, probably because I try to maintain the “Eco drive Green light”…. I love the 1.8s, but hate the fact that the Dash Board or A Pillar does rattle when on slow speed like 50-80kmh … weird … will bring this up during servicing. Honda Accord new model also can break down on the road. Do you think that Turbo engine no issue? Some more, some of the technician from Honda service centre, can be said that incompetent. After sale services are really poor! 10.4 sec 0-100 Kmh for the 1.8L NA CVT sounds about right. 8.2 sec 0-100Kmh for 1.5L CVT turbo is a very conservative time. Top Gear Philippines measured 7.6 seconds and Performance Drive YT channel measured 7.54 seconds for the RS model. The manual gearbox Turbo Civic should be faster again but it is currently only offered in US, Canada and China I believe. general consumer is embracing force induction era…. last time only rich can afford force induction but now thanks Honda, consumer can get force induction from a Civic. Hopes other makes will also start opt force induction into their C segment engine series, even just low pressure force induction means more power to fuel ratio and lesser CO2 emission. If I’m right, the 18 L engine in the Civic is the same one used on the HRV. It’s peppy and smooth, coupled to the CVT which becomes better after running it in for about 2000 kms. I would urge Honda to offer some of their cars with a manual transmission. Beware Turbo fans…….Turbos may generally reduce the lifespan of the engine, depending on the way it is driven. I have been using my Civic turbo for the past 5 months. Only getting 14.5km/litre. That’s for highway or city driving? a well written article on the 1.8 to help Honda clear some of their 1.8 stocks. What’s wrong with the hate of cvt? Seriously you Noob haters should really do your research before copying each other saying cvt is bad. Do you expect a Ferrari transmission in a normal sedan car? More roadtax, more FC, less power. I’d rather have the turbo. True, but also much less monthly repayment. Stretching loan to 9 years to so call afford the more expensive option is not financially prudent. Based on feedback from people around me, one of the reasons they opted for the 1.5T was due to the cheap and rough feel of the fabric interior of the 1.8S. If it had come with a better interior, be it better fabric or leather, at least as an option, the sales of the 1.8S would be a lot better. Ultimately, a good car let down by a poor interior option. I wish Paul Tan testers would comment on the noise inside the cabin also. In this case, I found the 1.8 Civic to be quieter than the 1.5 turbo version.